I had the great delight of attending Sydney Writer’s Festival 5×15 session on Saturday. Similar events have sold out in London, Paris and New York. It works like this. Five speakers tell stories about their ideas, passions and obsessions. Just two rules: no scripts, and only fifteen minutes apiece, in a kind of spoken word cabaret. The facilitator was my dear friend and fellow Darkling, Diana Jenkins. Diana is a freelance writer. She holds a research PhD in English from UNSW and is news editor for Varuna – the Writer’s House. 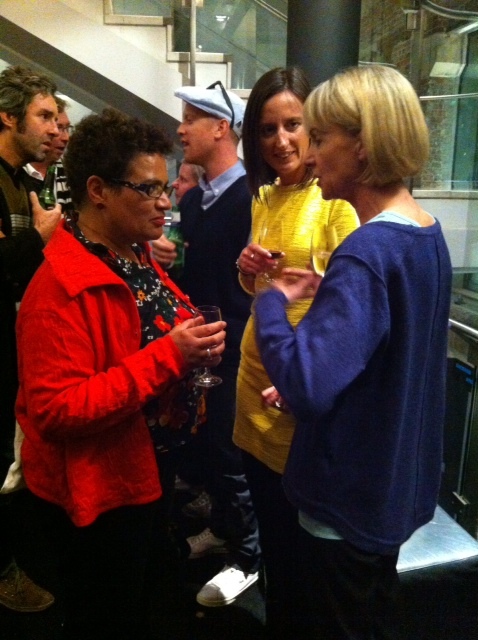 From left – Jackie Kay, Urthboy, Diana Jenkins and Kate Mosse after 5×15. Photo by Deborah Rice. The event brought together an eclectic mix of storytellers. First was Jackie Kay, who talked about taxi rides. Jackie is a hilarious Scottish poet, novelist and short story writer. Her novel Trumpet won the Guardian Fiction Prize, and her autobiographical Red Dust Road won Book of the Year at the Scottish Book Awards. The remarkable Amelia Lester shared some fascinating stories about fact-checking. Astonishingly, Amelia was appointed managing editor of The New Yorker at the grand old age of twenty-six. Award winning musician Tim Levinson, better known as Urthboy, talked about unclean slates and new beginnings. His album The Signal was hailed as a classic by Rolling Stone. In celebration of the government’s apology to the Stolen Generations, Urthboy reimagined Paul Kelly’s From Little Things Big Things Grow. The song helped raise over $100,000 for indigenous-run health and education programs. Next came internationally bestselling author Kate Mosse, who told of her passion for girl’s own adventure stories. Kate is the co-founder and honorary director of the Orange Prize for Fiction. The highlight for me however, was the final storyteller. 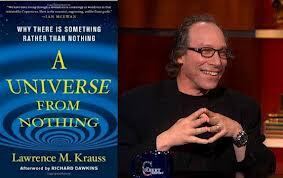 Lawrence Krauss is a renowned cosmologist, and hailed by Scientific American as a rare public intellectual. He has written nine books, including the international bestseller The Physics Of Star Trek, and more recently A Universe From Nothing. Lawrence explained how Star Trek saved the world. I won’t give too much away. Suffice to say, I’m even more of a fan of this funny, brilliant man after hearing his story. Lawrence is not just an intellectual giant, but a man of great courage and compassion. It was a great thrill to meet him. This entry was posted in Books, Writing and tagged 5x15, 5x15 London, 5x15 SWF, A Universe From Nothing, Amelia Lester, Diana Jenkins, From Little Things Big Things Grow, Jackie Kay, Kate Mosse, Lawrence Krauss, Orange Prize For Fiction, Red Dust Road, Sydney Writers Festival, The Darklings, The Physics Of Star Trek, Tim Levinson, Trumpet, Urthboy, Varuna - The Writer's House by jenniferscoullar. Bookmark the permalink. Inspiring, jennifer! Thanks so much for sharing this. It was SO much fun Desney! I envy you Jennifer. That really did sound like a lot of fun. I hope you managed to talk about your books somewhere along the line too! Jenny, with a support crew like the Darklings, no wonder it was such a happy occasion! Thank you for this lovely write up, you’ve captured it all perfectly and have been excessively kind about my own small role into the bargain. I had a marvellous time Di. Thank you for asking me!